Google estimates 300 hours of new videos are uploaded to YouTube per minute. Bravo! Video uploading to YouTube is straightforward, as long as you adjust the video with settings suitable for YouTube uploads. But the complex settings, ranging from YouTube video format, resolution, file size to codec, makes video uploading a hard nut. For this reason, we share the post regarding to the best YouTube video quality settings for upload and show you how to use a solid YouTube video editor to convert and adjust the advanced settings for YouTube uploads optimally. - No.1 fast to convert videos to YouTube, Facebook, Vimeo and more. - Adjust advanced settings for YouTube like resolution, format, codec, frame rate, bit rate, aspect ratio, etc. - Trim, crop, cut and merge videos, add subtitles to video to make video personalized before YouTube uploading. 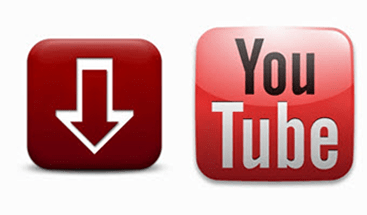 - Download videos (4K UHD) from YouTube and change YouTube video settings for mobile, like iPhone, iPad, Android, etc. YouTube recently changes its rules, which now easily accepts 8K and 4K resolutions and file sizes of 2GB, compared with 100MB in the past, and supports 8 video formats for uploading, covering MOV, MP4, AVI, WMV, FLV, 3GP, MPEGPS and WebM. Best of all, your videos can be optimized automatically by YouTube. Thus YouTube upload can be dead easier than before. Improper YouTube settings will lead to YouTube problems during uploading. So for the best YouTube uploading result, you may have a good understanding of YouTube upload limit and have to change some YouTube settings in advance. Here we list the YouTube recommended video settings, including bitrate, codecs, resolutions and more. * Frame rate: It's highly suggested not to change the frame rate and keep the encoded and uploaded content in the same frame rate it was recorded. Note: Please don't add Letterboxing to the YouTube video before uploading as the widescreen player will add pillarbox bars too. Or else, black bars will appear all around the video, resulting in bad viewing experience. Step 3. Click the Save button. If you want to make a video uploaded on YouTube visible only to people who have the URL, you can simply change the YouTube video privacy settings from Public to Unlisted. It sounds reasonable to adjust the video resolution, codec, frame rate, bitrate and other video settings for YouTube for better uploading result, but it seems to be a little bit sophisticated to deal with the change. What if there is a tool to accomplish the YouTube video setting task in one click. MacX Video Converter Pro comes to be your life saver. Added with the preset profiles for YouTube and other web services, the tool enables to directly convert videos to YouTube supported formats like MP4, FLV, 3GP, etc with all video export settings ready to match with YouTube rules perfectly. That means you don't have to be a tech geeks to adjust resolution, codec, frame rate, bit rate, etc any more but leave the tool to do this. Still, you can use the tool to edit the video audio parameter settings for your specific needs at your disposal, for instance, in need for a high quality video uploading to YouTube. Free download, install and run this all-in-one YouTube video converter and editor on your PC (Windows 10) and Mac (macOS Mojave) and follow the 4 simple steps below to convert video to fit best YouTube advanced settings at the highest quality. Step 1. Click "+ Video" button to load the video ready for upload. Step 2. Convert video to best video format for YouTube. 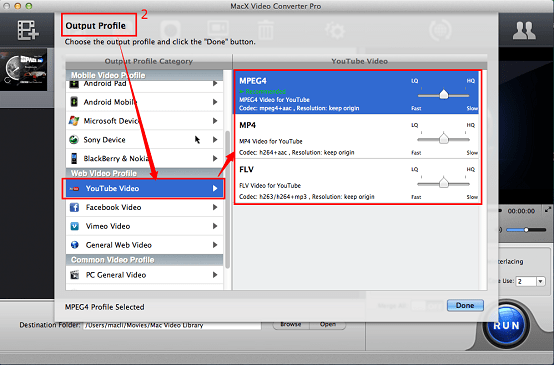 Go and choose Output Profile -> Web Video Profile -> YouTube Video -> MP4. Hit Done button. 1. You can tap the wheel-like icon on the main interface of the tool to set or change the video settings for YouTube to fit the bills. 2. You can hit the Edit button on the main interface to cut off unwanted part of your video, crop the black bars of YouTube, crop the video size, merge multiple videos into one, add subtitles or watermark to the video before uploading to YouTube. Step 3. Click "Browse" button to choose a target folder to save the converted video. Step 4. Tap "RUN" to start converting videos with best settings for YouTube uploading. 1. Convert among SD and HD videos, including 4K/8K UHD videos, such as MKV to MP4, 4K UHD to MP3, AVI to MP4, MP4 to MP3, etc. 2. 350+ readymade preset profiles for phones, tablets, media players, game consoles, video editors, online video services, such as iPhone 6S, iPad Pro, Samsung Galax S6, VLC, PS4, iMovie, Final Cut Pro, etc. 3. Download online videos from YouTube, Facebook, Vimeo, Vevo, and another 1000+ video sharing sites. That means it lets you get the best YouTube upload settings for mobile phones and tablets and enables you to play YouTube videos on iPhone iPad Android offline easily without changing any setting for YouTube one by one.